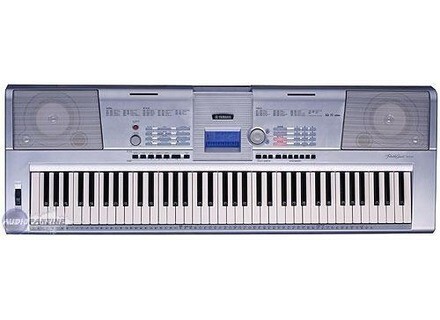 DGX-205, Keyboard Arranger from Yamaha in the DGX series. The DGX-205 is a keyboard that I call "user-friendly fun", because it's VERY easy to use (you don't even need the manual to start using it) and VERY fun to play. I got one of those as an "emergency solution". In the end of 2004, my old Technics keyboard got badly damaged and the authorized service couldn't afford with that (remember: Technics stopped to manufacture keyboards at all just the year before, 2003). Because of that, I was with no keyboard. Although I was on vacation, I couldn't wait too much to buy a new one, but my budget also wasnt't that high. Since I was playing mostly piano at the time, the DGX-205 fit well due to its nice acoustic piano sound and its 76 touch-sensitive keys. Although it's a beginner-oriented keyboard, it can be used by professionals too, since it works well as a master controller for software sequencers and some VSTi plugins - also as itself, if you're a pianist and want a really lightweight instrument. I even used it on big events with a band. The lack of MIDI IN/OUT and Line OUT is the only minor thing, IMHO - although it may be not a real problem nowadays. Too bad it was the last 76-key instrument from the DGX series with a nice keybed - from DGX-305 on, the keys were way too much fragile for my taste. If I wanted to get a DGX today and the options were 205 and 305, I'd choose the 205 just because of the better keys. So it's an overall nice keyboard for both beginners and pro keyboardists.